Marinate chicken pieces with ingredients given under marination for an hour. Heat oil in the vessel you are going to cook your majboos.Wash and soak basmati rice. To the hot oil add onion saute sprinkle salt..add ginger garlic paste and tomato saute for 7mins..add whole spices chilly powder pepper and dry chilli flakes saute for 5 mins.add the marinated chicken nd cover and cook. When its almost cooked add a cup of water and cover and cook for 5 more minutes. Preheat oven to 200c.line a tray with aluminim foil. Now take the cooked chicken pieces and keep on lined tray along with potato pieces coated and kept.bake for 30mins.or keep on tawa on low flame and fry without oil. Meanwhile add the soaked rice to the mixture in vessel add saffron water and one more cup of water.add required salt.cover and cook. 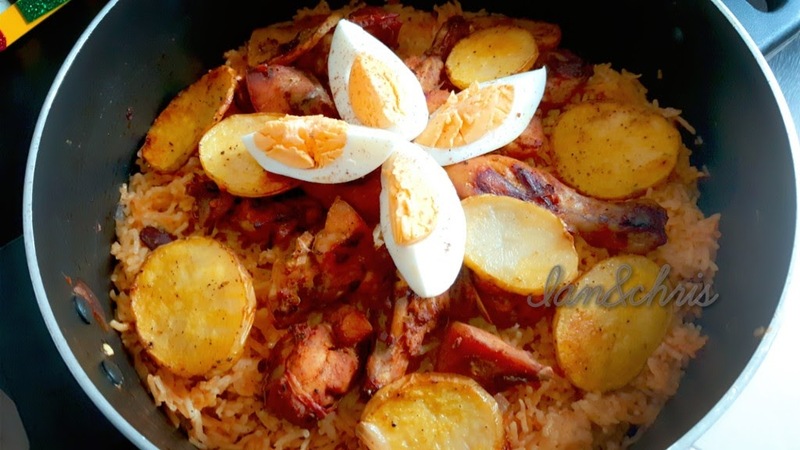 Once rice is done keep the grilled chicken.pieces on top along with potato pieces and peel and cut boiled egg and place on top.sprinkle a pinxh of pepper and nutmeg.. Done..your yum arabic chicken majboos is ready..